When the Wynn Las Vegas opened advanced wagering on the 2018 Breeders’ Cup Classic in mid-June, McKinzie sat at 30-1 on the board. As of Monday evening, he’d dropped to 12-1, and that’s without having run a race since March. Obviously, the Bob Baffert-trained 3-year-old is gaining support in a bid to upset the Nov. 3 Classic at Churchill Downs. A son of Street Sense, McKinzie is pointing to the Sept. 22 Pennsylvania Derby as his comeback race from a hock injury that prevented him from running in the Kentucky Derby. 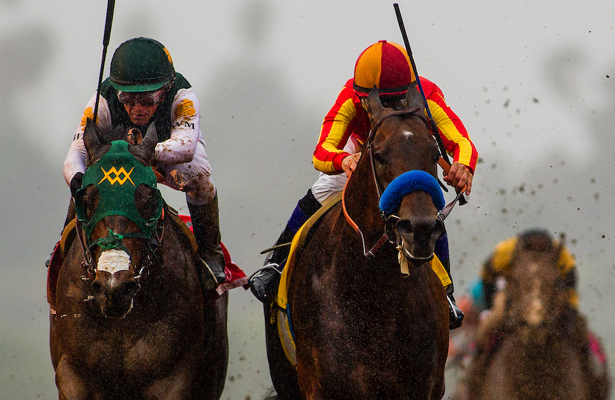 Baffert has said both the Classic and Breeders’ Cup Dirt Mile are possibilities leaving the 1 1/8-mile Penn Derby — so McKinzie is no sure bet to enter the championships’ featured race. New odds released Monday evening show leading older horse Accelerate as the 9/2 favorite. West Coast, another Baffert horse that would come off a layoff in the Classic, remains the second choice at 5-1, with Diversify third at 6-1. A slew of contenders — Catholic Boy, Collected, Thunder Snow and Yoshida — are each 10-1. And then comes McKinzie, who was first across the wire but placed second to Bolt d’Oro last out in Santa Anita Park’s Grade 2 San Felipe Stakes on March 10. It marked the colt’s lone defeat in four career starts. He has worked consistently toward the Penn Derby, putting in consecutive seven-furlong drills in his last two breezes. A full list of the Wynn's Breeders’ Cup Classic prices can be seen below. Click in the bottom right corner for full screen viewing.